The manufacturer's logo is indicated on the heel and on the sole, as well as the specific boot sizes in the "Mondopoint" and European systems. 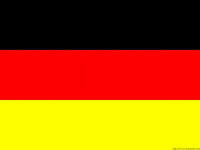 Sometimes, the logo is not indicated. The boots top is made of composite materials (49% - leather (suede) and 51% - reinforced polyamide (Cordura), the mesh insole: 100% polyamide). 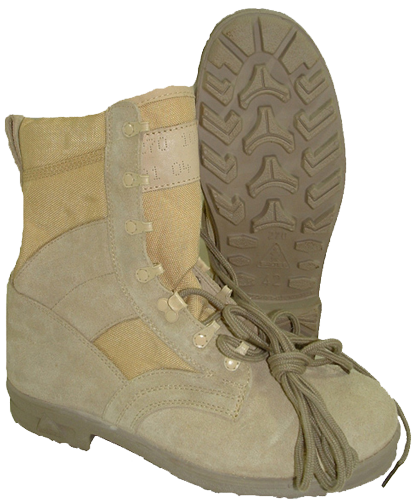 - The reinforcing backside inserts, also protecting the malleolus bones are made of sand-coloured suede (thick dark olive coloured Cordura is used for jungle boots). 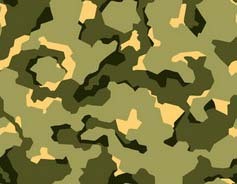 From a distance and by colour the German army "jungle- boots" resemble the famous American "jungle-boots"; but only from a distance. 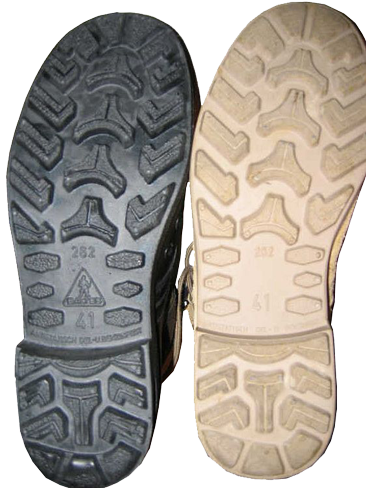 A closer look reveals significant differences between these types of boots for the jungle, starting from design and ending with materials used. 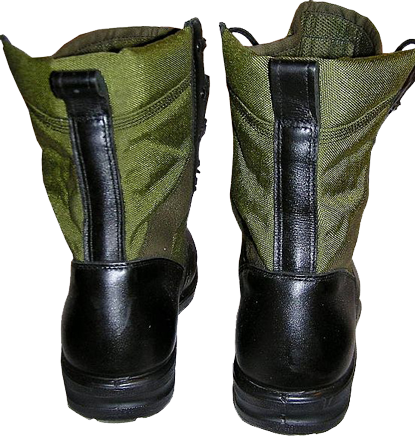 The common elements of German and American boots are the location and the material (stainless steel non-ferrous metal) of two mesh eyelets (drain holes) on the inner sides of the boots - it is 100% American design, allowing the wearer to withdraw quickly the water from the boot, then to dry and ventilate the feet inside. 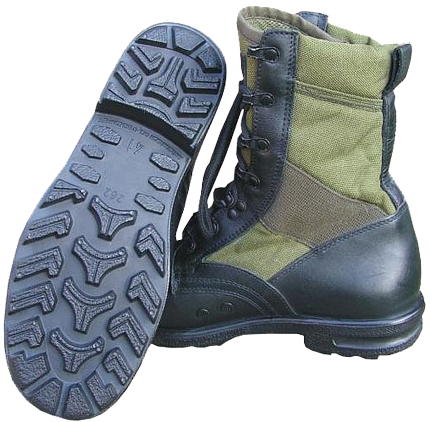 The principle of this system is not in preventing any ingress of water into the boots, like the rubber footwear does, with all disadvantages of this concept. Just the opposite, the water can easily get in the boots, but not less easily it can be withdrawn. 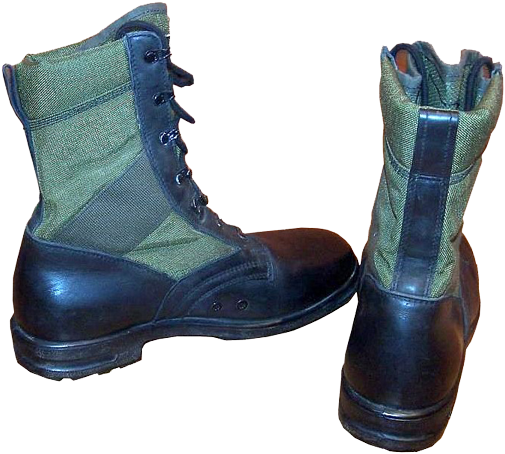 The back side of the Bundeswehr "BALTES" boots with loops for laces wrapping around is already different: the backside strips with loops are made of leather, unlike cordura or canvas (in early models) in the American jungle boots. 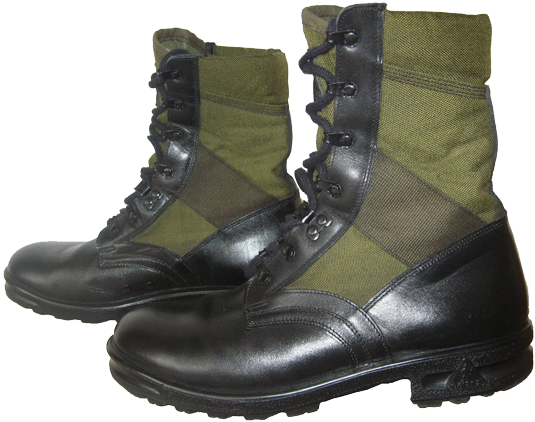 The boots top is composite very similar to the "desert" boots: (black smooth "hydrophobic" (i.e. specially treated and impregnated) leather and polyamide fabric (Cordura), mesh insole is 100% polyamide). 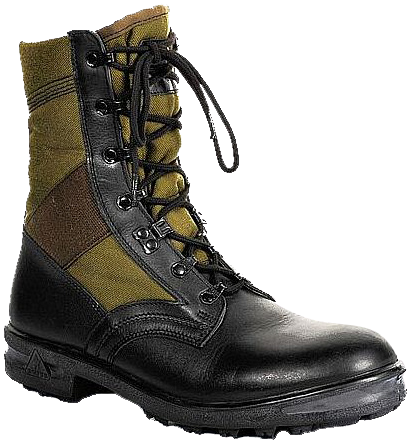 The boot's toe and heel welts with speed lacing eyelets are made of genuine leather; the tongue and the reinforcing inserts sewn opposite to the malleolus bones and the top are made of Cordura, lightweight and breathable material. A thick cushion on top of the boots provide additional comfort of wear and protection against water, dust and small stones.